“Blasto fungus” is an infection caused by a yeast-like organism blastomyces dermatitidis endemic in decayed wood, leaves, and damp soil. Blastomycosis (see VIDEOS below) has become a threat due to record 2013 wet weather. “Blasto fungus” (the pronounceable acronym) infects pets and people. Farmers, hunters, campers and gardeners are at higher risk due to frequent contact with damp soil and in the latter case, mulch and decaying matter used for fertilizer. Your dog (or cat) is at even higher risk. Although the infectious fungus is also airborne, pets are at high risk. Dogs sniff the earth and paw at the dirt to enhance whatever scent intrigues them whereas outside cats dig in the soil to go potty. Disturbing soil that contains the blasto fungi transfers it directly into the nasal pathway. Blastomycosis can be picked up on the pads of the feet as well. Dogs lick their feet, cats wash themselves; both actions transfer the mold spores directly into the mouth, nose, and eyes. Blastomyces dermatitidis is therefore not uncommon in dogs and cats. If your dog’s skin becomes irritated and inflamed, particularly around the mouth or nose, have him vet checked. Pets can be misdiagnosed and blastcomycosis fungus can cause blindness, lung problems, and ultimately, death. Symptoms of Blastomycosis are similar in people and pets. 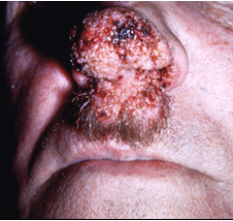 In addition to direct skin contact on facial areas and feet, blasto fungus spores are often inhaled into the lungs. This is particularly dangerous because early symptoms may be misdiagnosed as an allergy or even pneumonia. Blasto fungus is more common along the eastern seaboard, the Mississippi, Ohio, and St. Lawrence River valleys and the Great Lakes area where there is more humidity. 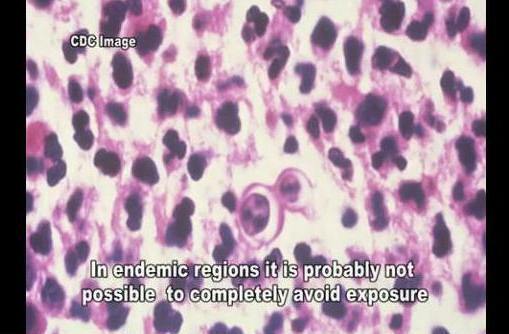 The CBS news video below calls it “Chicago Disease.” The infectious mold is most frequently found in moist, acidic soil that is rich in decaying vegetation. Obviously groves, gardens, and mulch piles should be treated with respect although the airborne fungus can be exposed any time the soil is disturbed such as in construction sites. There is no reliable means of detecting Blastomyces dermatitidis in the soil so caution is advised when digging, plowing, or harvesting crops. Blastomycosis has even been found in dolphins! It is not uncommon in horses (mouth and nose soil contact) and primates but is most often diagnosed in pet animals. It is not contagious and in fact, blasto can be a self-limiting pulmonary infection. However in dogs (or people) with lowered immunity, it can spread through the blood or lymphatic system and attack other organs and tissue. 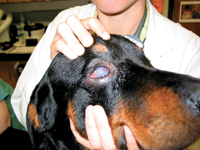 Veterinarians report it is most commonly seen in the eyes, lymph nodes, urogenital system, and skin. Whereas you can’t be sure that your fenced property does not harbor Blastomyces spores, you can be certain a roaming dog is going to sniff at everything, especially soil which holds messages left by other dogs! Because this is such a deadly and/or disfiguring disease which, even in people can be misdiagnosed, our editors provide you with two different videos in Video Theater. 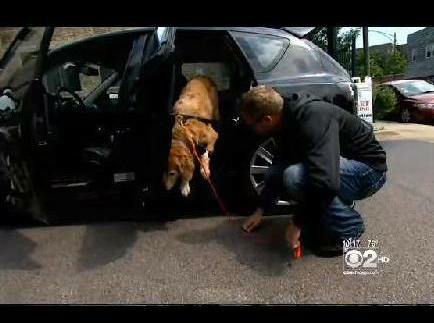 The first is “fungus attacks dogs VIDEO” by CBS news and the other is a three minute, medical but not too technical youtube program aptly titled “Blastomycosis: blastomyces dermatitidis VIDEO”.